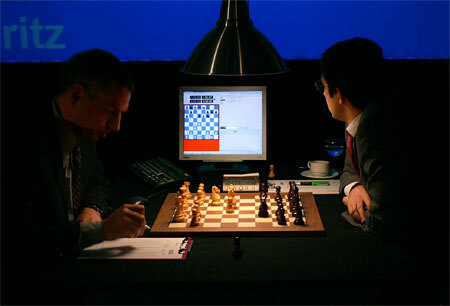 a Man versus Machine chess duel dubbed World Chess Challenge (WCC) 2006, of Classical, and since October 2006, Reunified FIDE World Chess Champion Vladimir Kramnik versus Deep Fritz 10 by Frans Morsch and Mathias Feist was staged from November 25 until December 05, 2006 at the Art and Exhibition Hall  in Bonn, Germany. The WCC was sponsored by the RAG AG, a large German coal mining corporation represented by chairman Werner Müller, former German Minister of Economic Affairs and Energy (1998–2002) in the cabinet of Gerhard Schröder. Kramnik's starting fee was $500,000, with option to double in case he would have decided the six-round duel in his favor. Patron of the event was chess lover and at that time German Minister of Finance in the cabinet of Angela Merkel, Peer Steinbrück (SPD). In 2012, when he was about to become 2013 Chancellor candidate, he was accused of malpractice due to his trials, albeit unsuccessful, of funding public money for the Kramnik vs Fritz match from the in parts state-owned Deutsche Post and Deutsche Telekom      . The WCC was organized by Universal Event Promotion (UEP) with investor and match director Josef Resch  , in cooperation with the Art and Exhibition Hall  . The match ended in a 4-2 victory for Deep Fritz with two wins and four draws. Kramnik missed winning chances in game 1 and 5, overlooked a mate in one in game 2, and finally lost game 6 versus a resistless Fritz playing a strong novelty. 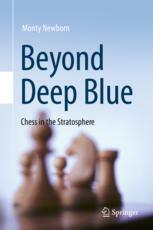 Calling Fritz "the world's leading chess computer program" is not just stretching the truth, it's blatantly untrue. I refuse to believe that ChessBase is unaware of the existence of chess programs stronger than Fritz. They are lying, plain and simple. It is also getting boring to always watch the same programs get the chance to play against the top GMs. 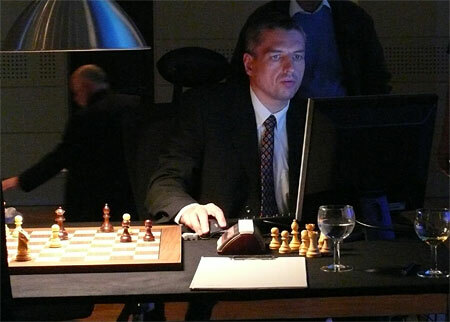 Since December 2006, the (computer-)chess world has a new Overchampion, in the entity DEEP FRITZ 10. 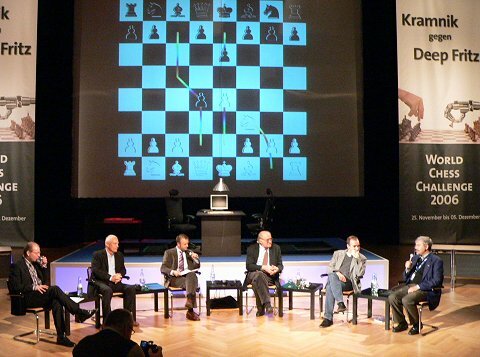 The way the program won its match against World Champion Vladimir Kramnik was superb. 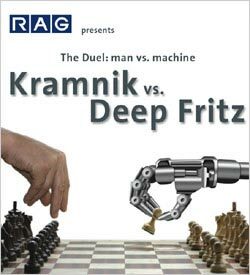 If we disregard the win in the second game and only at the final game, we must admit that DEEP FRITZ 10 is the better player, the Overchampion. The Overchampion most clearly showed its strength in game six by introducing a novelty followed by a couple of brilliant ideas. Our congratulations go to Frans Morsch, Mathias Feist, and the ChessBase team for their continuous improvements of the program, their perseverance to reach this goal, and their outstanding achievement. Meanwhile we observe that there are many runners-up. They believe that they are equally strong or even stronger than the Overchampion. In this issue Jeroen Noomen provides overview of the 2005 revolution and the ratings of the runners-up. He discusses Rybka, Zappa, Fruit, mentions Hydra, as well as Junior, Shredder and Fritz. Whatever the case, the current situation is as follows: Junior is the 2006 World Champion and Deep Fritz 10 the 2006 Overchampion. This page was last edited on 19 February 2019, at 10:29.